As we must be at 10 AM in Galway train station to be picked up by Healy tours for our tour around the area known as The Burren, we will take a train at Heuston train station in Dublin at 7 AM. That makes us wake up very early to arrive on time to take this train. When the tour finishes we will be delivered at train station before 18:00 for our return trip to Dublin. We must wake up that early as per going out from hotel at 6 AM. It’s still dark night and we can feel colder than here while waiting for the bus. We take 67A (1.70€) which leaves us at Heuston train station few minutes after 6:30 AM. Train time is 7:10, so we just need to identify everything inside the station for finding where to go for our tickets. It’s at left, where some machines can deliver our booked tickets after using credit card for paying the 31.50€ per person. So, Heuston, we haven’t got any problem (I’m sure you thought the same joke). We get how this machine works in a few minutes and, on despite the panel is showing our train is the one in the far right platform, we ask to the first person wearing uniform we can see for a confirmation in order of preventing ending on the other side of the country, which, better thought, is actually where we’re going. We choose an empty coach for getting it full with us and, immediately, get to sleep. When I open my eyes is already completely light and we can see through the windows an infinite green flat land, with no even a minimum hill, with cattle every when and then. The 2 hours and 45 minutes of the trip goes lightly and train arrives to Galway a few minutes before 10 AM., as expected. Somehow, when we’re out find out nobody is waiting for us. We wait for ten minutes before I start to get nervous and I go to the square I can see from the station entrance to check if there is somebody there. On these minutes I’m grateful of not having paid in advance, which is always a guarantee. It’s at 10:15 when a Healy Tours van with only the driver inside appears for starting our tourist journey. The driver tells us we will join the group later but, in the meantime, we have him and the van all for us. He tells us we’re going directly to Ailwee caves now. Before leaving, he has taken the 16€ per person of the tour and gives us a receipt in return. On our way, the driver, who is doing the guide role too, keeps commenting and explaining things about the region with a plenty of jokes in between. Some of the historical anecdotes have a so forced joke on it that I cannot avoid wonder if they’re all fake. The purpose of those is not learning, though, but entertaining, and there is where they do their job. We arrive to the caves entrance, in the middle of a charming place, after one hour in van. On the last part of the trip the sea appeared. On land side, all are vast grasslands limited with small walls made with the peculiar stones of this area. The entrance to Ailwee caves itself is made with these stones too, where we can find a hall with a souvenirs store. Then, some stairs take us to the darkness of these caves. There are some stalactites and stalagmites, but just a few and really small and lonely. The most beautiful here could be the water falling on sides. These are just small volume of flow falls. These caves can be a highlight in this country, where there are no mountains, but they’re not a big deal compared what we’re used to see in Spain. When we’re looking the souvenirs available in the store, the women came in to take us out to see how it is snowing. That seems strange as it was a good weather when we came in, but now is even better because, when we’re out, we can see a good sunnier day. For a moment, we think they were kidding with us in a way we cannot understand, but when checking their truly amazed faces and hearing their “I swear, it was snowing” we think we meet the famous “All season in one” weather, so typical in Ireland, which means they live the four seasons every day. So, at least, the winter is done for today. We’ve spent 45 minutes in the caves and the next spot is Poulnabrone Dolmen, which is at 30 minutes from here. Somehow, we’re surprised by another stop in the middle, when we’re going across Ballyvaugham town, to see its church and joining the main group as we were told before. The old stone, mouldy and blue, is the main characteristic of this church which interior seems as being improved a lot of times. The area around the church is beautiful too, with statues and crosses and that feeling we get sometimes about how different is something we’re really familiar with, as a stone church, in this case. Now we’re reaching the dolmen indeed after 20 minutes through the peculiar landscape of The Barren, with this specific mix between grass and grey stone. We cannot see it when leaving the bus as we must walk a little bit until it. I hope it is really prehistoric to avoid feeling as an idiot. These are three flat stones forming three sides of a square; the fourth one is the ground. That’s it. It is not especially big and it seems something you could do in your home easily. Well… every time we’re closer of our main target, which we’ve just confirmed it is going to be our next stop: The Cliffs of Moher. But before, we’re being driven through The Barren area and we can see what is called Lemenagh Castle, although it seems a neglected house better. We get the Cliffs quite late, as we’re beyond 1:30 PM and we’re given only 20 minutes for visiting them as we cannot miss the lunch. It’s so few time for our more expected visit. We’re delivered what seems to be a one euro entrance ticket. We’re crazy about reaching the edge, where the land seems to suddenly end, and look over it to the sea. When we reach the spot we get shocked for a while. The height of these walls which seem pretending to contain the whole sea, is spectacular and, as you’re so high too, the view to the horizon covers such part of planet surface that you can see this fantastic clear blue sea curved. Obviously you’re not allowed to reach the very edge of the cliff and some walls are there as obstacle. We walk along the path in close to the edge amazed by the rough way this fine grassland ends. It is really the immensity of this landscape what astonishes you and what makes impossible taking a fair picture of it . We go to the Visitors centre for the last minutes to get some souvenirs and go back to the bus to go to lunch. We’re taken to Doolin for this and we’re delivered in front of Fitzpatrick’s bar and all the group go in there, but here are more restaurants here and we can lunch wherever we want, so we drive our steps to Cullinan’s restaurant, just in front of the bar, with the only reason of doing different than the rest. We find it closed, so we come back to Fitzpatrick’s where we lunch some dishes by 10€ each. We end before being picked up again, so we spend the time making pictures of these piles of signs we could see around here, as we have one just in front of the bar. It’s 3 PM when we’re back to the bus for the last part of this tour around The Burren but we don’t stop until 45 minutes later, when we can go out to this area, where the typical grey rocks of this place seem to break against the sea waves. This part has its special charm and we enjoy our walk around it. I don’t know if this spot corresponds to the one labelled as “Black Head lighthouse” because I don’t know where we are, but I can say there is no trace of a lighthouse here. We’re returning to Galway as this is almost over. We can feel it and the clock is saying it too, some how, we still do a last stop, 45 minutes later, on Dunguaire Castle. As all brochures I could see set this castle as first visit of the tour I thought we missed it. But we’re given some time to explore the area as it seems we cannot go into the castle. The lake adds some beauty to the place and let the swans to come. 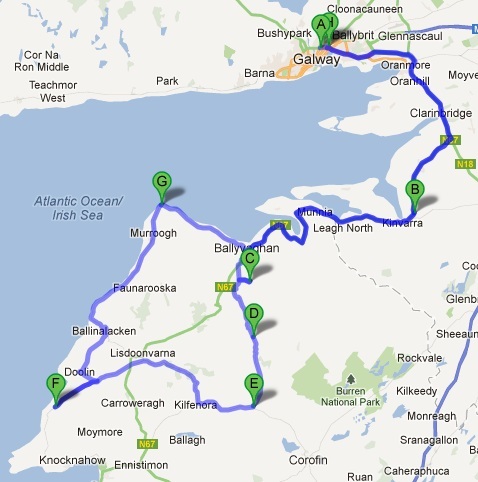 We’re saying goodbye to all this area as we’re taken definitively back to Galway. The tour is over and the feeling about it is you cannot get more for less. We’re delivered the first ones at train station a half of an hour before the time of the 6:05 PM train we must take and we’re surprised to see a row of people waiting for it. When it arrives, as the train is long enough, we can enjoy a coach just for us again and we make the almost three hours of this trip more enjoyable by doing trips to the bar for bringing some Guiness cans every time. When we’re back in Dublin we’ve got time enough as per our investigation about what is the object these cans bring inside by breaking one of them: a ball. It seems this ball has the purpose of assuring froth all the time by its moving inside. We arrive at hotel at 10 PM to get some dinner there and we decide to go out for a while after it and go to Temple bar area as yesterday’s rule is over. We’re not allowed to go into Temple bar itself, the bar giving name to all the neighbourhood, and we end in a big pub in front of it, occupying all the floors of the building, and which terrace at the top floor, is allowed to smoke as it is open air. Our look contrast with the locals’. Just one sample: a young woman in a short shoulder strap dress asks me for fire and I use clumsily my lighter because I keep wearing gloves, as well as scarf and woolly hat.